"Great race in a cool little town"
The High Bridge Half Marathon was a very enjoyable experience. I arrived in Farmville at 6:40 to pick up my race packet. They were very prepared, so without a clue as to where anything was I was able to get my stuff, use the restroom (a must) and get to the start line with plenty of time to spare. The weather was absolutely perfect for a race day, we were cold to start but not freezing. From what I hear, I was very lucky to run the race this particular year as it can usually be hot and horribly humid. The course is a tightly packed gravel that I found to be awesome for running and racing. The reduced impact was definitely noticeable and I had no trouble with it. The course is boring in a way because it's really just a long, flat, straight line where you turn around at the halfway point. However, the High Bridge is AWESOME. It's about a half mile long with an awesome view. The course is very PRable. I got mine! Although the course is flat overall, I think that it seems to be a very slight incline going out and a slight decline coming back. That sure helps. The finisher medal is a fairly typical medal, as are the award medals. The shirt is a typical moisture wicking shirt with a fairly cool design. One perk was that AG award winners got their choice of previous year "retro" shirts, so I got an extra. There were also beer vouchers that could be used at a local restaurant that day. You were allowed to have any beer that they had on tap and they had some good ones! The food was excellent too. 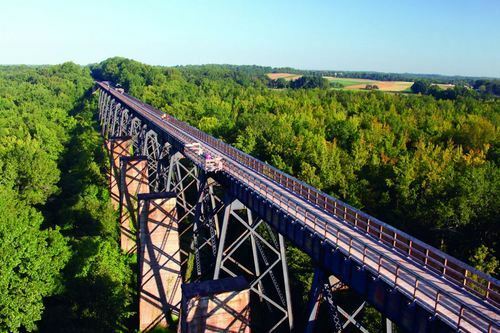 All in all, if you have a day to spend in a little town you've probably never visited and you want to run a race with a unique view from the High Bridge, you should give this one a shot. You might even get a PR out of it. "Tough, Humid and Challenging. A Great Training Test." First off, let me say that you will probably not enjoy this race. The course and conditions make this race a challenge for any runner. It's not particularly scenic. It doesn't have a ton of spectators. I usually tell people that I don't like it. That being said, the Lynchburg Half Marathon is a great race to run. Many runners are often training for a big event. We have goals. We work hard in the summer to be ready for whatever we decide to take on in the fall. The Lynchburg Half is the perfect race to test your training. It's a small, local race so of course it will be missing some of the things that are fun about larger races. The packet pickup is at our local running store, Riverside Runners. There's no "Expo", but it's a pretty great running store. The shirt is always a good shirt. Some of my favorites are from this race. I like some of the shirts so much that I refuse to put them in my smelly running shirt rotation and I wear them casually. The course is well organized, marked and has plenty of volunteers to keep you going the right way. The course is mostly flat, but there is a long climb up a gravel road that will test you. There are other less significant climbs throughout the course as well. The good news is that you get to run down the hill that you had to climb and the last 3-4 miles are all flat or downhill. This year's finisher's medal is AWESOME. They haven't always been awesome, but I think more emphasis is being put on them than in the past. I look forward to collecting more of them. 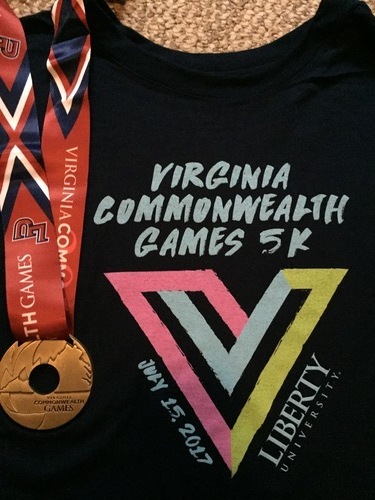 The Commonwealth Games 5k is the 6th race of a 7 race series that takes place in Lynchburg. This particular race takes place on the campus of Liberty University. There's a big hill right at the beginning, but if you make sure not to put too much into that, the rest of the course is fairly flat. The course is well marked and there were plenty of volunteers to make sure we didn't get off track. The race is well organized, as are all races in Lynchburg. Race directors have been doing this for quite a few years now and have the support of a great local running store, Riverside Runners. Shirts are nice and soft but are the moisture wicking type. There aren't finisher medals, but the AG medals are awesome. They look like legit medals. One perk to this race is that if you win an award, you are eligible to participate in the State Games of America. More info is available at CommonwealthGames.org/sga2019. I would certainly recommend this race to anyone in the area. Lynchburg is for runners. "The ultimate test of intestinal fortitude"
The Krispy Kreme Challenge is a race that should be experienced by all. Such child-like joy and excitement! The thought of running 2.5 miles, then consuming a dozen donuts, followed by 2.5 miles back the way you came sounds horrible but it's so worth trying. There is a "challenger" entry as well as a "casual runner" so you have the option of not making a pig of yourself with the donuts. There's a costume contest as well and people bring their "A" game for it. I've run the KKC 8 times and don't intend to miss it any time soon. Donuts: Delicious! The "hot light" isn't on and it's the middle of winter, but they are as fresh as it gets. Course: Nothing to write home about. It's from the NC State campus to the donut shop and there isn't a whole lot to see. There are a few hills, but nothing too scary. I wouldn't worry, because you have no chance at a 5 mile PR with those donuts involved. Expo: Not much to it at all. Like nothing to it. They sell some KKC gear and that's about all there is. Shirt: The shirts can be clever but for 7 of my 8 years it's been a white cotton T-shirt with green lettering. 2017 was a white cotton T-shirt with black lettering. Finisher Medal: They've only had finisher medals once in all of my times running the race and you had to pay $5 extra for it. Not a bad deal since the early entry was only $20. The medal is pretty awesome though. To reiterate, you will not regret running this race if you like donuts and have a soul. So much fun! "A Great Race Since 1974"
Honestly, I'm a little bit biased because I live in Lynchburg. That doesn't change the fact that this is a great race. The organizers do a fabulous job. There's a great food spread for finishers. The finisher medals are always top notch. The spectators are great. The course is a killer, but a ton of fun to suffer through. There are massages! It seems as though the whole city of Lynchburg is there to be a part of it. The evening before the race, there are kids' runs of varying distances and a ton of activities for the families to enjoy. This event is more than a race. I encourage anyone to pay Lynchburg a visit and have a great time.